I am not really a fan of V-brakes. The number one reason for this is the Tektro V-brake that came on my girlfriend's city bicycle. The Tektro V-brake was difficult to adjust and align. After a short while the springs did not spring back correctly and it started to rust, I broke of part of the frame mount trying to service it and broke a tool trying to turn a seized and stripped adjustment screw. One of the brake arms got bent, the brake pads worn out because the springs would not pull them back and drag across the rim. After riding around a few months without functioning front brakes I decided to invest in this old bicycle once again and get it fixed before the winter were it will probably be ridden through snow and ice. It was hard to decide on what replacement V-brake to get. There are many available, and they start pretty cheap. After the bad experience with the Tektro I decided to spend a few extra euros (17 to be exact) and get a Shimano Deore V-brake. The Deore groupset is intended for mountain bikes, so should be more than enough for a city bike. I got the new 2014 model, no idea how it compares to the previous model, it was only available in black, I believe there is also silver version. I was able to get a matching brake lever discounted (10 euro) because it had damaged packaging. The brake levers come in two sizes: 1.5 fingers (BL-M590) and 3 fingers (BL-M591). The main difference is that the 1.5 has shorter levers meant for using the index and middle finger. This is nice if you have very powerful brakes that only require a small pinch, like most hydraulic braking systems. The V-brakes have quite powerful springs which need quite a hefty squeeze. The 3.0 finger lever seems like a better fit. It also matches the Nexus brake levers already on the bicycle in length (but a different color). Both the brake and lever came neatly packed in their own boxes with instructions and mounting hardware. The item description online was not very clear but I was pleasantly surprised that the mounting bolts, and even the noodle was included. Installing the brake and setting up the brake pads was a breeze, much easier than the Tektro brakes. Because the mount on the right side had broken off earlier I could not use the supplied bolt, but with a longer M6 bolt that I had laying around I was still able to make it work. The reason I ordered a brake lever was because the brake lever (Shimano Nexus) of the rear brake was in bad shape. The thread of adjustment bolt was stripped off. I decided to connect the rear brake to the right lever and the front V-brake to the left. It is not ideal because the V-brake cable goes up on the right side, but it works. 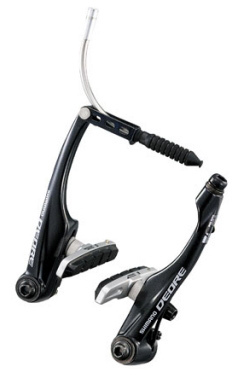 The Deore brake lever can only be used for V-brakes while the Nexus one can also be used for roller brakes. It is a little bit harder squeeze the lever than sI would like, but at least they return to their position well. The lever made some noise when first installed, but after braking with them a few times that went away. This is normal and is mentioned in the manual. The original brake pads lasted quite long, 10 months with nearly daily usage in the city. I chose to replace them with the same kind: Shimano M70R2 for "severe" conditions. The brake came with cartridge style brake shoes on which the brake pads are replaceable. The rubber pads are held in place by a locking pin which can be pulled out with some pliers. Being able to replace just the pads is supposed to save money and time. Replacing the first pad was easy, but I did spend somewhere around an hour with the second one. The new brake pad would not slide in all the way. I tried lubricating it and filing it down, used all kinds of tools to push it in. I even removed the brake shoe to get a better grip. I was able to get it almost all the way in, but not far enough for the locking pin. In the process I also damaged the brake pad slightly. I tried it with another brake pad, but had the same problem. My guess is that the brake shoe is manufactured out of of spec, or damaged somehow. For the next pad replacement I will just get a new set or brake shoes as well. Responsiveness, stopping power and modulation are all much better than the Tektro brakes ever were. The Deore V-brake and brake lever go a long way in redeeming the humble V-brake. I still prefer disc brakes, but if all you have is some V-brake mounts on your frame the Shimano Deore might make your bicycle safer, more enjoyable to ride, and to work on.